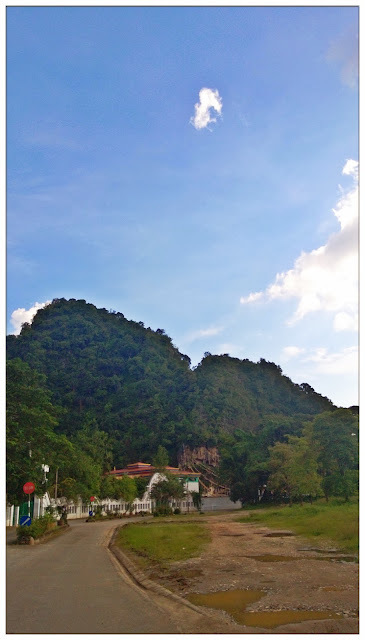 It's been quite some time I last went for a road trip with friends, thanks to Honda and Manoah Consulting, me and my fellow blogger friends managed to go to Ipoh for a road trip with Honda's Hybrid series cars. Yes, the cars were ours for 3 days 2 nights! That's what make the whole road trip's excitement to a brand new level! Me and Senri's Lil White for the next 3 days 2 nights! Specially request a white car because I love white. Haha. 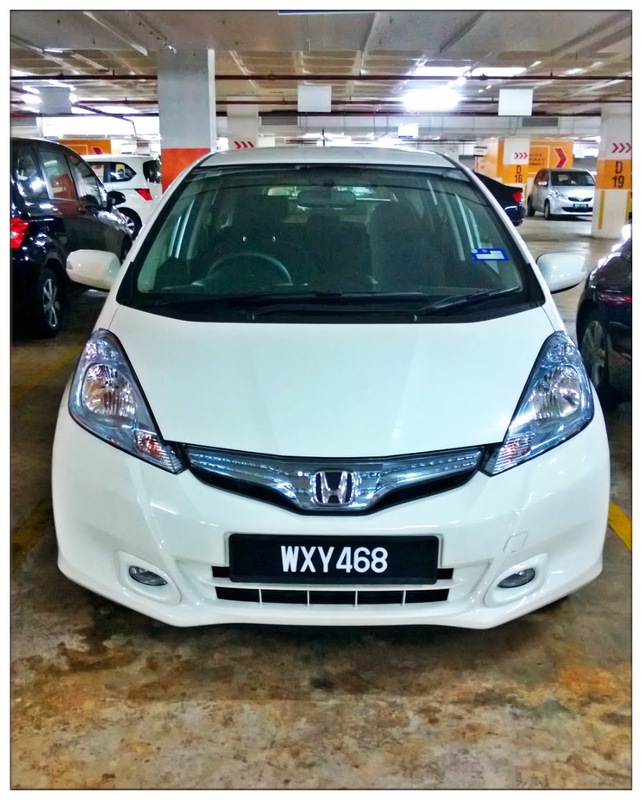 Lil White here is a Honda Jazz Hybrid. 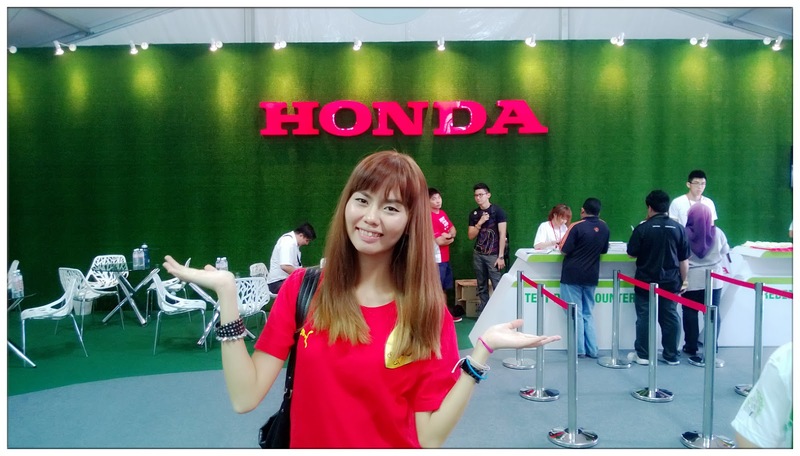 This is the first time I drive a Honda, and Hybrid series, so I'm a little nervous when first ignite the engine. Kinda triggers the phobia in me to drive car that aren't mine due to involved in an accident early this month but I try my best not to get too carried away with the fear, and voila, all ends well and I'm still a pretty good driver! Ask Senri if you disagree, your argument is invalid lol. The interior of Lil White. Love love loveeeee the chic design! 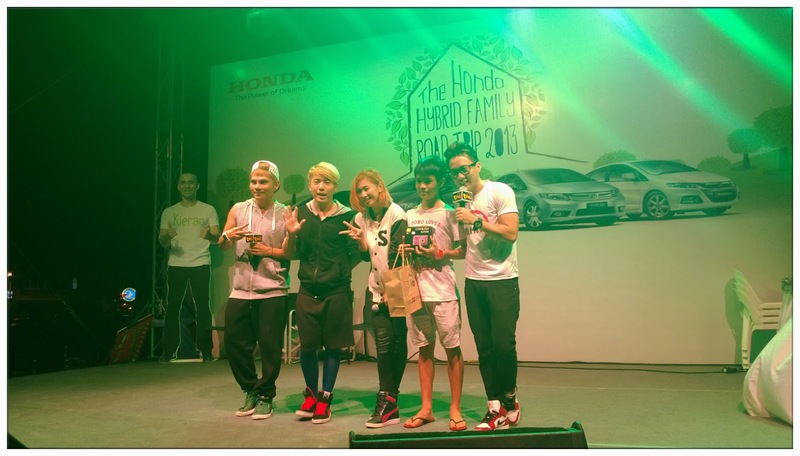 Now this Honda Jazz Hybrid is a produced-in-Malaysia hybrid series car, with its green technology and also better savings for fellow Malaysians, we have a better choice and also contribute to a better environment. By how you ask? By clicking a green button, ECO mode ON! Beautiful lights of the Speedometer indicates which mode you are currently driving. How Honda Jazz Hybrid works for fuel economy and helps the environment? 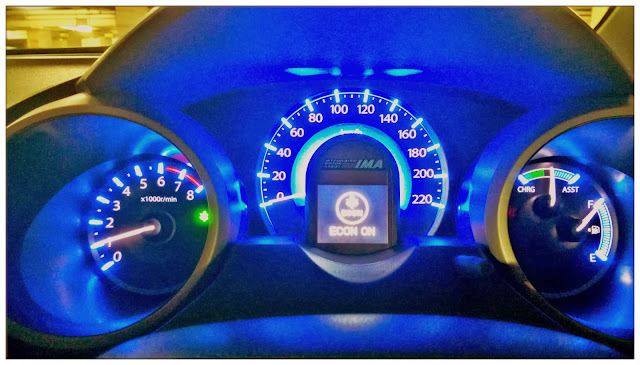 Yes, by pressing the ECO button and with its Integrated Motor Assist (IMA) hybrid system. With the ECO mode on, your Honda Jazz Hybrid will run on both engine and the electric motors to optimized fuel saving efficiency depending on the style you drive, especially city drive where you drive and stop in more frequent times. While your speedometer is in green, that means your car is actually running the engine motor instead of fuel, which helps you save the fuel emissions. The engine motor will automatically recharge when you step on your brake. As I mentioned above, this is the first time I drive a Honda Jazz Hybrid, so when the ECO Mode is on, while stopping for red lights, the car will automatically shut down. I wasn't quite sure what happened for the first few times, it kinda make me stare at the dashboard as well, but after then I realize it is because of the ECO mode. Hahaha. Silly me. So, on a sunny Saturday, me and fellow bloggers en route to Ipoh! Me and Senri as a team, well, you know, when girls get together everything seems so fun and gossiping has never been more juicy when you're on highways and nothing gets in your lane or need extra attention on the road. lol. 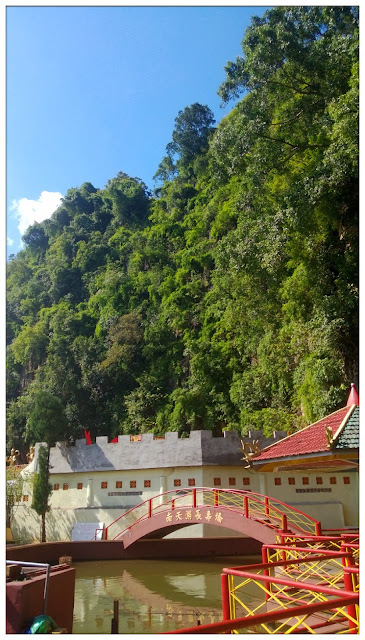 We head to Sg Buloh's Bridge Restaurants to get our breakfast and coffee fix, then start our journey with awesome songs Senri loaded into her mp3 the day before. Did I told you that good sound system is one of the must for me when selecting cars? 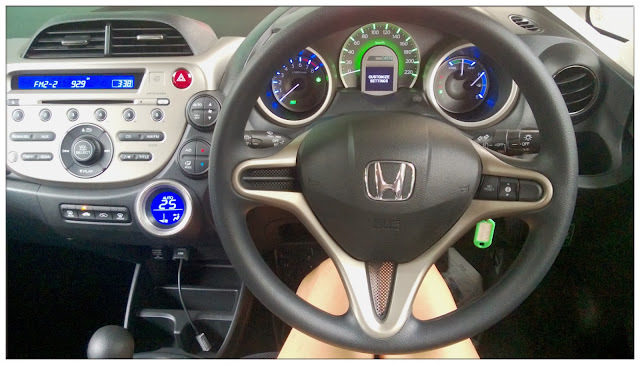 Honda Jazz Hybrid captured my heart in every possible way! Enjoying the scenery and relax while Senri did the driving. Being passenger is not that bad actually. lol. We started the journey a lil bit later than the rest, so we all agreed to meet up at Tesco Ipoh Timur directly. 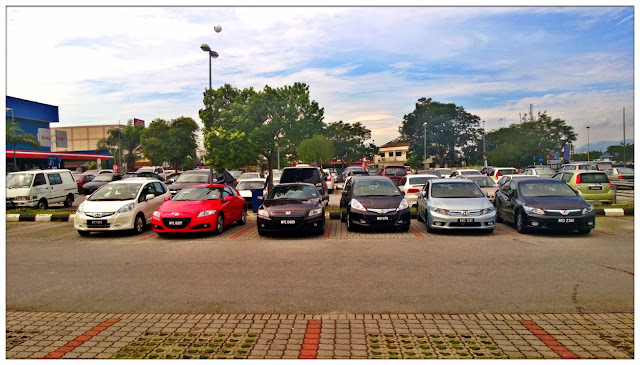 We reached almost the same time as the rest of the bloggers, and the Honda Hybrid team of KL looking stunning when we all parked our car together. 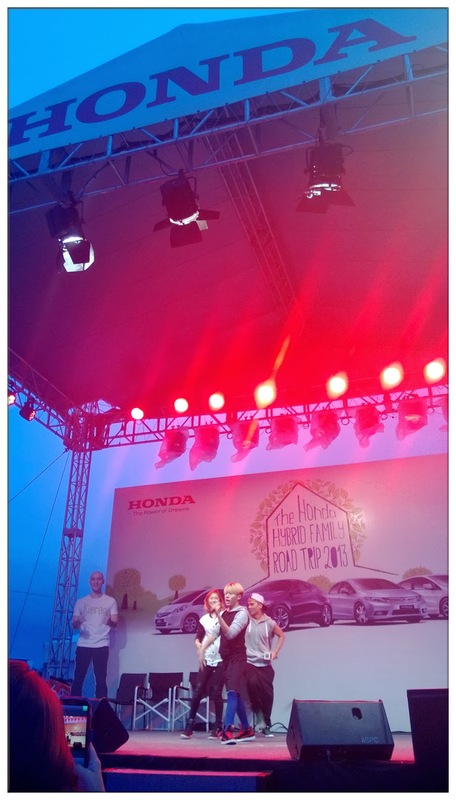 Okay, now is time to visit the roadshow of Honda Family Road Trip 2013. For those newbie to Hybrid cars, did you know that Honda Hybrid series of year 2012/13 is the all-new-Hybrid-series with longest battery warranty period and also the widest range of hybrid cars in Malaysia! Through this roadshow, I get to know and understand how Hybrid system works with the I-VTEC engine and engine motor and also how to achieve fuel efficiency with Hybrid car. Ride the bicycle and feel the difference how the engine works for a hybrid car. 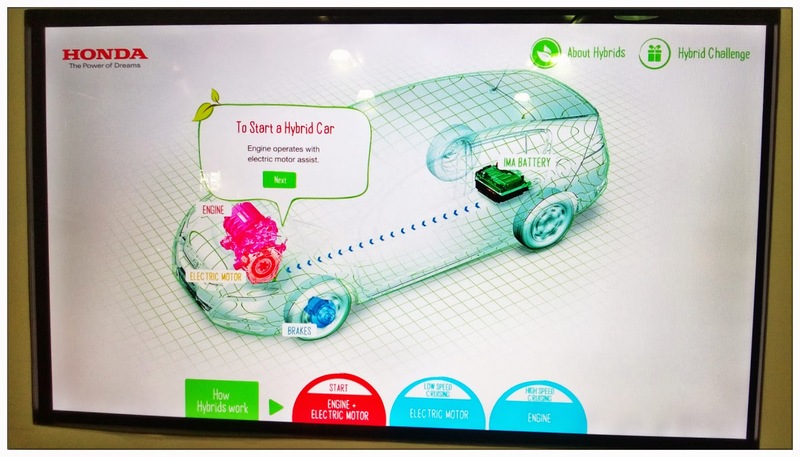 Many fun activities are there for visitors to play and gain knowledge of Hybrid system cars at the same time. 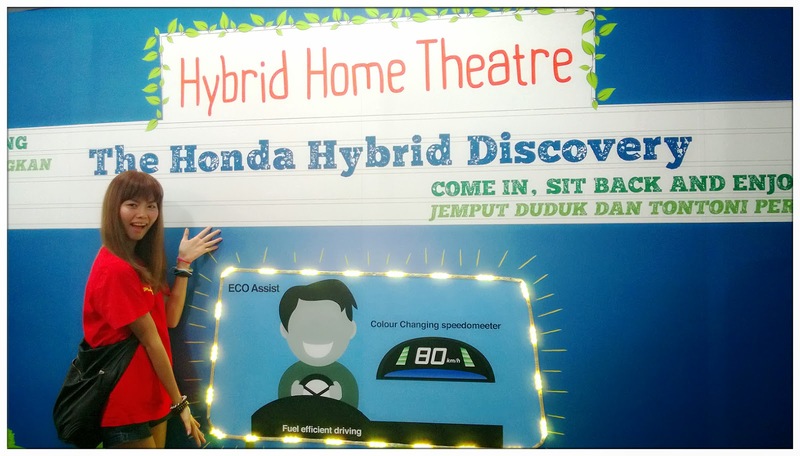 You can either ride a bicycle, play a simulator game, go to the Hybrid Home Theatre or play with a Hybrid Challenge and win yourself a gift from Honda! 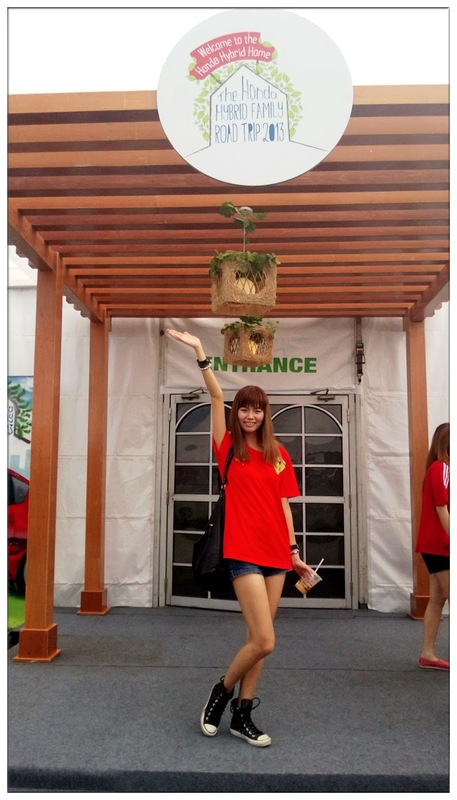 Played this game and got praised by the assistant as one of the fastest to complete the challenge muahaha! Of course, that's not all. There are car displays in the showroom where you get to see, touch, feel the cars by yourself. Honda CR-Z Hybrid has the coolest and sporty design, Honda Civic Hybrid is the most comfy ones, Honda Jazz Hybrid is my all-time-favourite! Now I wish I own a Honda Jazz Hybrid for its fuel efficiency and its chic design. My dream car! Later that night, the Honda Family Road Trip 2013 organized a concert for the fellow Ipohians to come join the fun with all the celebrities as well as local artists such as Danny One, Gina, Soo Wincci and much more. Respect all the artists for giving all out while performing their songs with dance and singing. There are also lucky draws for the audiences and they are giving away awesome stuff like Crabtree & Evelyn, Nikon Cameras and so on! Congratulates to all the lucky winners that night! 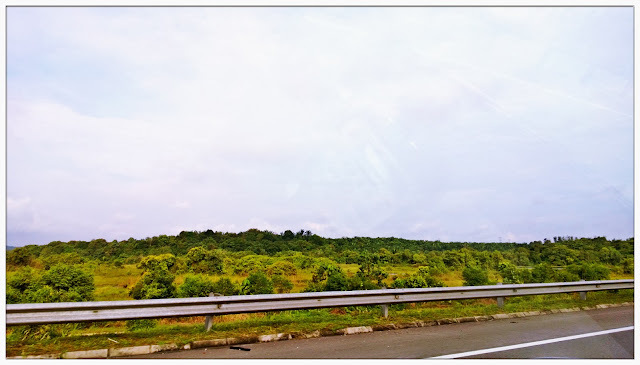 After the roadshow and road trip, I can't keep myself for thinking that how do a car driver can help produce a cleaner air environment as well as preserve nature around us for ourselves as well as the generations to come. I guess that instead of car pooling and taking public transportations, Hybrid cars will be one of the solution. While the Hybrid car is in low speed cruising, it will solely reply on the engine motor all thanks to the IMA hybrid systems where there will be no fuel emission during low speed cruising with a Hybrid car, where indirectly keeping the air around clean. That means while you are driving around city area like Kuala Lumpur, the fuel emission is actually lower than normal cars, which help prevent air pollutions. 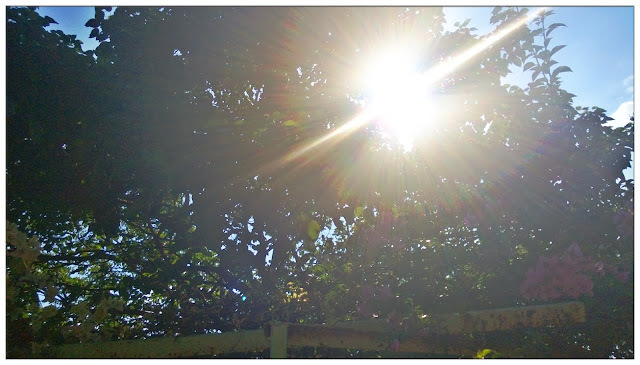 Air, although is free, but is a precious elements where all the living things on earth rely on. We wouldn't want to take it for granted and let all the beautiful nature that are currently surrounding us disappear one day just because we didn't care to take any action in preserving the nature. Maybe one day that these (beautiful nature of the photos I took during the Ipoh road trip) will never appear in our lives again, how sad it is to just imagine that day to come, right? 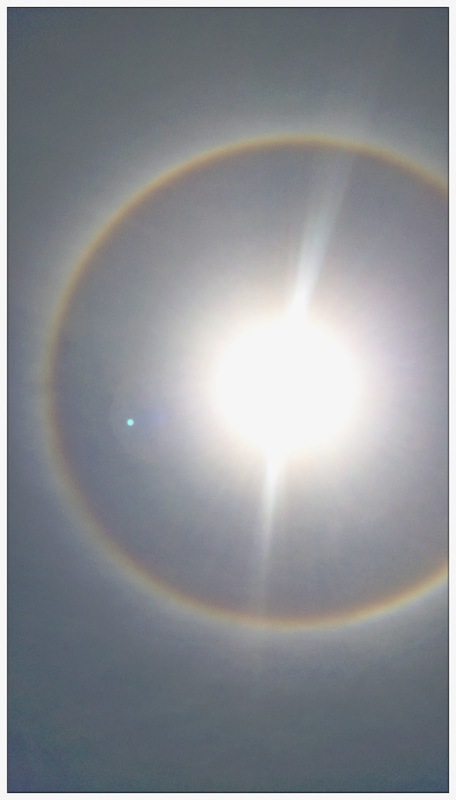 Beautiful Halo that makes our day magical! 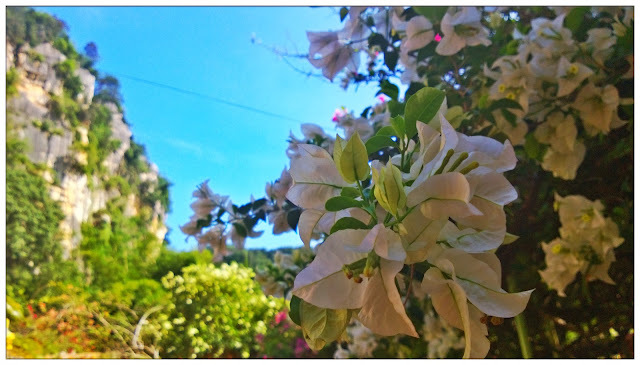 Blue sky and green scenery. Imagine that one day we won't be touched by these beautiful gift of nature, how sad our lives will be? I wouldn't want any of these disappear in my life, I'm sure that you do too, right? Don't let all these become just painting we can only show to our next generations. Preserve the nature now, with our own ways! And I truly believe that Honda Hybrid cars can help preserve the nature. 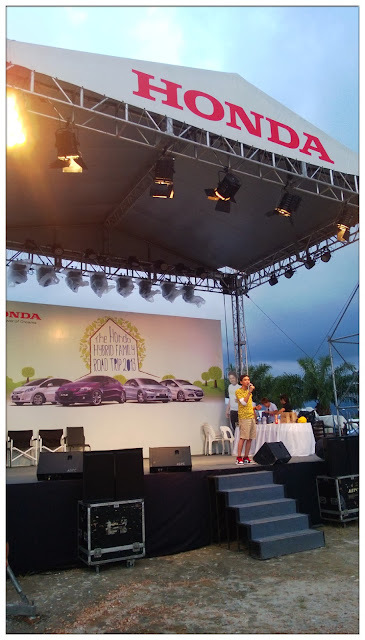 Thank you Honda Malaysia for the wonderful roadtrip, and also teaching us ways to help reduce fuel emissions with Honda Hybrid cars as well as how to preserve the nature through choosing the right car and right ways of driving.